In addition to a good clinical examination, there are two types of x rays that are needed in order to provide a thorough diagnosis. These x rays that provide two dimensional images are known as Bitewings (BW) and Periapicals (PA). In this blog we will look at Bite Wings. Generally, these x rays are taken once per year and are used to diagnose decay that is found in between the teeth and in new or recurring decay under existing fillings. If you look at the x ray above, you can see a large cavity on an upper pre molar tooth. It is a large dark grey area located on the side of the tooth. This is considered to be a very large cavity; in fact it looks like it may be ‘communicating’ with the nerve, which means it will most probably need a root canal. When decay is so close to the nerve, the individual usually feels symptoms relating to the tooth i.e. cold and sweet sensitivity. You have to wonder whether or not this patient flossed. Remember, floss removes food and debris that accumulates in-between the teeth. If left behind, the bacteria in the mouth will break these substances down into acids that will initiate the decay process. If these acid attacks occur repeatedly and are not counteracted by episodes of remineralisation, then a cavity is sure to result. 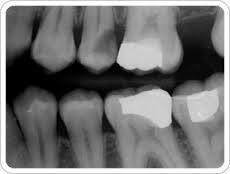 Dental Fact: There is usually 40% more decay present in the tooth than what you see in the actual x ray. Demineralisation is the ‘eating’ or ‘rotting’ away of both the enamel and dentin of the tooth. This shows up on an x ray film as a dark spot within the tooth structure. A cavity or lesion appears dark because the x ray beam passes readily through the affected area. In contrast, a silver filling would show up as whitish and opaque because the x ray beam cannot pass through it. Bite Wings also enable us to see the bone level (the height of the alveolar bone) which anchors the roots of the teeth in the mouth i.e. Is the house on a good foundation? Bitewing x rays are taken from a perpendicular angle to the buccal or cheek surface of the tooth. This ‘view’ is important as they accurately depict the true bone level as compared to say a ‘periapical’ view. Check in next week when you’ll learn more about a periapical x ray. Yours in good dental health!